The word no is often associated with negativity, but sometimes saying yes to everything in work can lead to more problems than a simple no. 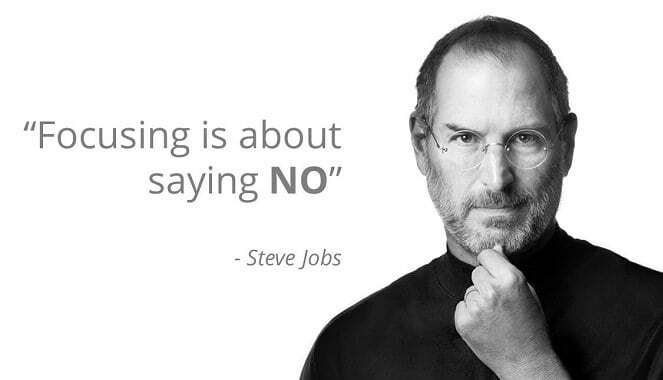 Steve Jobs once said, “Focusing is about saying no”. Meaning, to be successful you must focus on what has to be done, instead of adding more to your to do list and hence, lowering the quality of all your work. The hardest thing about saying no tends to be the fear of letting someone down, a manager, a colleague or perhaps you don’t want to seem like you are out of your depth. It’s important to know when and how to say no before you become overwhelmed with all the work you should have declined or pushed back to a later date. Nobody needs an answer straight away, so when your boss or colleague asks you to help them with a new project take your time and think of all the consequences. Tell the person you will check your schedule and get back to them. Ask yourself, have you any free space and what comes first, is it what you have in your diary or this new project. If you feel you are stretched far enough and other things are a priority, then you have your answer. There are several ways to say no, and many of these ways can be positive. Firstly, call up to the person’s desk, email tones can be easily misconstrued or picked up incorrectly. Instead of being passive aggressive stating how much work you already have on, perhaps start by thanking your manager for thinking of you for this project. Then share your current schedule, and your current priorities, explaining how it’s imperative you get X projects done and correctly. Sometimes in work, certain projects have more preference than others. Depending on what kind of position you are in your boss may be the best person to ask about this. Your idea of what must be done and your bosses to do list could be different. So, ask for help prioritizing your schedule and if he/she thinks you can push back on the timeline of another project then you can work together to do so. If all else fails and you can’t find the time to take on more work, help your colleague or boss find a solution. Saying no can be made that bit easier when you offer an alternative, perhaps you could ask some of your fellow colleagues if they are free to help. Otherwise, share your schedule with your boss and highlight a date in the future where you have the time to start the project. The truth is everyone ends up saying yes more often than not, as we don’t want to be seen as incapable or that you are not a team player. Making a weekly plan can also help avoid biting of more than you can chew. If you set weekly goals for yourself, you can easily see if you have time in your schedule for anything else. So, it’s important to remember that saying no from time to time will make you a more productive, efficient and healthy worker in the long run.